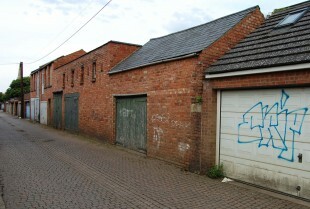 Martin visited Northampton for the funeral of our much-lamented colleague Ken Tickell, and had a look at our first workshop, in the mews behind Holly Road near St Matthew’s church in Northampton. Not much has changed there, in the 29 years since we left. Quite a lot was achieved in five years we spent in this tiny space, originally no doubt designed for the pony and trap of the inhabitants of 101, Holly Road.